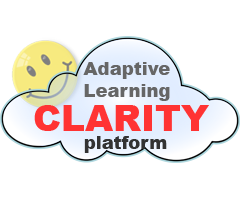 CLARITY is a cloud-based platform for visual Rapid Design of Adaptive Courseware with Quality Assurance and automatic generation of Dynamically Adaptive, Competence-Based, Personalized Learning with Success guaranteed by Root-Cause Diagnosing. There are no available media yet. Learn more about the features that differentiate CLARITY from the competition. Learn more about CLARITY's pricing options so you can make a business-wise decision on the best software to use. Find out how CLARITY stacks up against its most popular competitors.